Jumping on points are important when starting a new arc in comics. I’ll admit that I haven’t read Gail Simone’s run on Batgirl yet due to some obstinance on my own account over the new 52, retconning Barbara as The Oracle, and the fact that I was legitimately enjoying Bryan Q. Miller’s run with Stephanie Brown from what I had read of it. (Speaking of, guess who may have finally found the first two volumes of that series at MSRP?) Simone’s run is on my wish list now though. Partially from curiosity and partially from a suggestion of a friend. 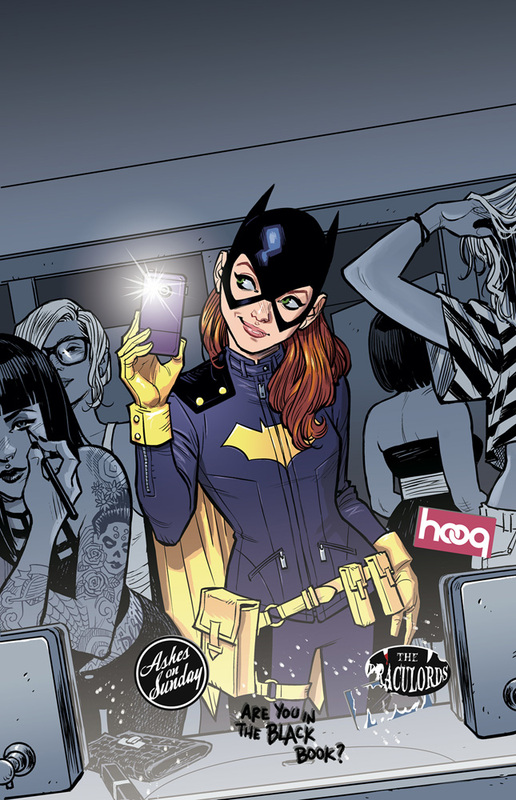 Still, what got my curiosity more was the announcement of the new Batgirl arc starting in #35. I wrote about it when it was announced, but there was going to be a change in creative teams that would send the book in a new direction. One a little more youth oriented and light hearted than the previous arcs. Not to mention a fantastic new uniform that was very specifically leather and not spandex. I have to say, it definitely works, and not just for the fantastic new costume. The concept around this new Batgirl arc is that Barbara has moved across the river of Gotham into Burnside, which is the hipster-y neighborhood much like Williamsburg to Brooklyn. Barbara is restarting her life after a fire destroyed most of her things and she starts at grad school. Of course, with a sketchy guy who speaks partially in hashtags stealing and uploading personal information of the people of Gotham, it’s not hard to fall back into old steps. While Barbara’s position as Batgirl is still a point of conflicting feelings for me, Batgirl #35 is a splendid jumping on point for the series. Tarr’s art with Wicks’ colors is completely lush and while the writing at some points feels a little try hard, Stewart and Fletcher capture the struggling millennial 20-something spirit pretty damn well. 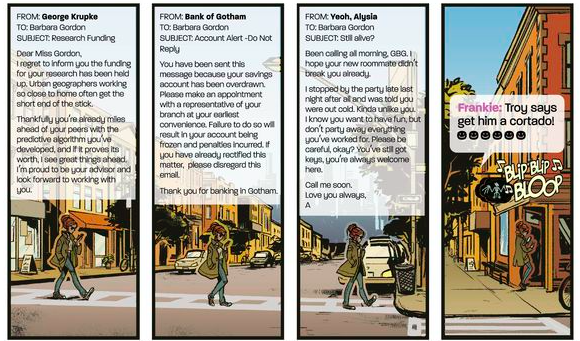 I love that Babs’ tech genius translates perfectly to a world where tech seeps into every part of our lives. Not to mention there’s a tradition of adorable queer roommates. Frankie is such a babe. Final Thoughts: If you love Ms. Marvel, definitely give Batgirl #35 a shot. There’s a very similar spirit there with a young heroine living life on her own terms, even if she’s constantly trying to figure our what those terms are. Not to mention that Babs Tarr’s art is kind of amazing.